Save money by shopping carefully for new tires. You have been driving your car for three or four years and have noticed that your tires are showing signs of wear. Regular rotations and the occasional realignment have kept your tires in fairly good shape, but the miles have piled up and tire age is another consideration. If you plan to keep your car, then you need to get new tires. You may be able to get away with just two tires, but with retailers offering deals on a set of four, an all-around replacement may be your best choice. 1. How long you plan to keep your car. If you plan to keep your car for another year or two, then opt for tires with a 40,000-mile tread wear. You’ll save money over tires with a tread life of 60,000 to 90,000 miles, and will offer the next buyer or dealer good tires that wont negatively impact your cars resale value. 2. The kind of driving you do. The best bet for tire shoppers is to choose all-season radials, regardless of whether you live in Florida or in Minnesota. Such tires provide superior grip and can handle light winter driving weather conditions. Some tires are also better for performance cars. For instance, summer tires enhance handling, but are not very good with traction. Other tires offer a more comfortable ride, but aren’t great for cornering. Your tire service professional can show you a variety of tires, each with benefits for the type of ride you want. 3. Exchange size for size. Your car came off of the assembly line outfitted with certain tires that are best for your vehicle. Although you may have room to get a different sized tire (and wheels as well), you would do best to stick with the tire size you already have. 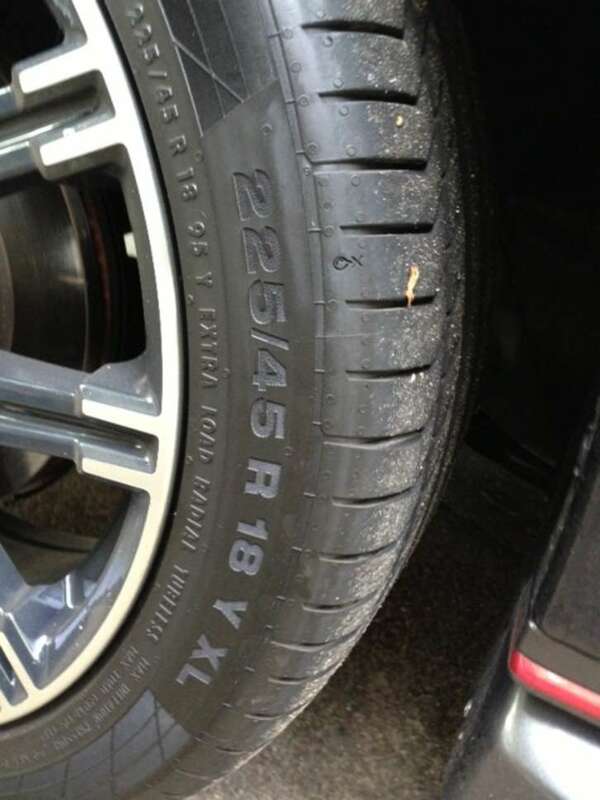 Check your tires sidewall and take note of the code that is printed on it. For instance, you will see something like this: P185/60R14 82H. The P tells you that it is a passenger car tire. The first three numbers (185) gives you tire width in millimeters, the 60 represents its aspect ratio and the R is for radial. The 14 is the wheels diameter and the 82H represents its load index and speed symbol. You will find other information printed on your tire too, but the code is of greatest importance. 4. Shop for new tires. Shopping around can save you a bundle on new tires, but please know this: manufacturers really would like for you to replace all four tires and will usually offer incentives when you buy a full set. Those incentives typically include a rebate that you can apply immediately to your purchase price and may range from $50 to $70, sometimes more. Essentially, you’re buying four tires, but are paying for three. Prices vary from retailer to retailer so check newspaper ads, look online and call around for quotes. 5. Consider a service plan. New tires come with a warranty and that means if your tire wears out early or is destroyed, the manufacturer or retailer will offer a pro-rated price on the old tire to apply to the purchase price of a new tire. Consider a service or protection plan if it delivers benefits you determine are worthwhile including free tire replacement, free rotations, one or more free front-end alignments and safety checks. You’ll pay for the plan, but it might prove worthwhile to you. Follow manufacturer guidelines on choosing the right tires for your cars. Rotate your tires on a regular basis and always keep keep your tires properly inflated. Proper inflation numbers can be found on the inside door jamb of the drivers door or in your glove box. Use these numbers and not the numbers found on the tires. And don’t forget your spare one of your older tires could be an ideal replacement for an aged or worn out spare.